RECOGNISING. The lesser water boatman and the backswimmer are always worldwide mixed up. Again: they are NOT the same. So to better recognise the lesser water boatman he is compared to the backswimmer on this page. 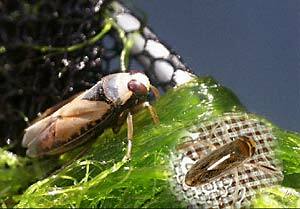 If you take a haul with your pond net from a healthy pond or ditch, and lay the content on the shore, you often see pale insects, about 2 centimetres long, jump out of it with awkward movements. Better let them be: these are true water boatmen and they have a powerful stinging beak which they may jab painfully in your fingertip... Don't worry: they will jump or fly back to the water on their own strength. Now some smaller, weaker jumping insects are left in our net: lesser water boatmen, which fortunately won't sting us. On the picture on the left you see a backswimmer (sitting right side up - out of the water they try to stay on their legs), and at the same scale in the lower right corner a Sigara species. Sigara is a smaller member of the Corixa family, other Corixa species are up till twice as large. If you study the lesser and the true water boatman or backswimmer in an aquarium you will come to the conclusion that are many differences, already somewhere in 1915 the Danish professor Wesenberg Lund (see literature) wrote (free translation): "From a biological viewpoint the animals are mirrored to each other in every aspect". His comparing points you see in the table on this page. Main difference is that the true water boatman swims upside down (hence the name backswimmer): and the lesser water boatman 'normal'. Many names over the world witness this fact. In the table here you see drawings (freely drawn after a KNNV determination index) of the two water boatman types. Please note: with Corixa we mean species of the lesser water boatman in general and with Notonecta we mean species of the backswimmer alias the (true) water boatman. Fixed head, long movable snout (proboscis) Movable head, short, rather fixed snout. You see: though resemblant, they are different in many aspects. Furthermore the backswimmer as a rule is larger (about 20 mm against 2 - 15 mm). At the backswimmer the hind legs are longer then middle, with Corixa these both pairs are the same in length. The two front pairs of legs of the backswimmer are about the same (grab- and hold function), while all three leg pairs of Corixa are totally different, more details here. Take a look at he black triangle in the backswimmer drawing, it's the dorsal shield (scutellum) which covers the chest (thorax). Lesser water boatman species don't have this, except Micronectae. Corixa mostly feeds at the bottom, on which it rests with only the two middle legs. The lesser boatman is no hunter, more the hunted. It has a total different way of living. Corixa has a faint arched back. The backswimmer is build with a high arched back to go upside down, cleaving the water as a little rowing boat. The lesser water boatman is more a "little tumbling submarine". In an aquarium you hear now and then the hard head ticking against the glass at the rhythm of the rowing legs. Camouflage: Corixa is dark on the back, so it is lesser visible at the bottom, its silvery bubble and the lighter belly side are less visible against the sky, as seen from below. Because the backswimmer hangs upside down, the back is pale, and the belly side dark! On the next page we will take a closer look at the lesser water boatman.